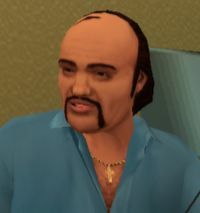 According to an in game dialogue between Barry and Phil Collins, before Barry became Phil's manager, Barry used to manage a talking dog called Puddles. Coincidentally or not, the name of the character bears a bizarre resemblance to an Australian soccer player who played in Romania, Michael Thwaite. Barry is voiced by Timothy Spall. This page was last modified on 8 August 2012, at 21:54.